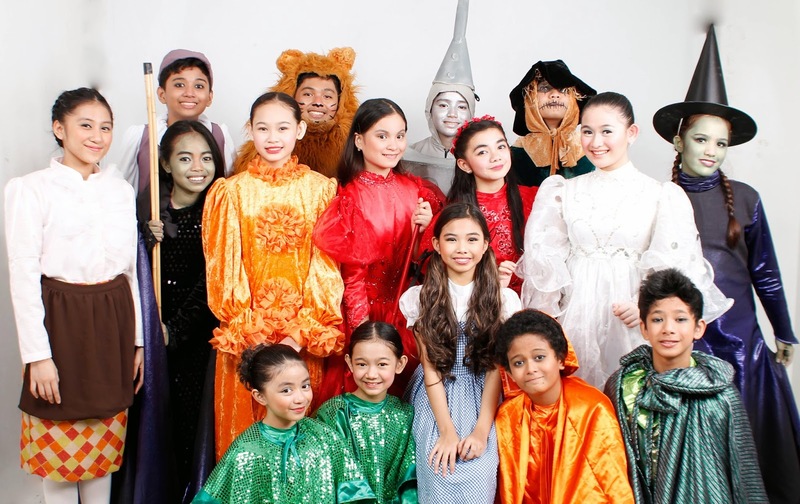 As a season offering to all children, Kids Acts Philippines proudly presents “ The Wizard of Oz ” with script and lyrics by LUIGI NACARIO and music by EUGENE BELBIS. The story is adapted from the popular version of “The Wonderful Wizard of Oz” by L. Frank Baum. The Wizard of Oz is story of a young girl named Dorothy Gale from Kansas who always imagined of beautiful things somewhere over the rainbow. One day, a cyclone came that hit her house and spinned up inside the cyclone, floated down through clouds and crashed to the beautiful and colorful land of the munchkins, the Munchkinland. Her adventure started by following the road paved with yellow bricks to meet the Wonderful Wizard of Oz and asked her way to Kansas. Along the way she met Scarecrow, Tin Woodman and Cowardly Lion who became her friends and went with her to also seek help from the Wizard. Their journey became so thrilling and enchanting because of the magical powers of the four witches of Oz, the Wicked Witches of East and West and the Good Witches of North - Belinda and South - Glinda. All Witches had magical things that made Dorothy’s adventure delightful, from the Silver Shoes of the Witch of the East to the broomstick of the Witch of West and from the magical kiss of Belinda to the Glinda’s revelation of the charm of the shoes. The story is about determination, love, courage, honesty and an important place like no other in the world – home. Discover the true charm of the Silver Shoes! Is The Wonderful Wizard of Oz true or a humbug? Kids Acts Philippines will unfold the whole story on stage showcasing the genuine portrayal of the TheCampArt Kid Actors, the scholars’ pool of the company ages 7 to 15 years old. This is a musical play for kids and by the kids augmenting children’s interests in performing arts. The artistic team of THE WIZARD OF OZ is composed of Eugene Belbis (Orchestration); Christian Bautista (Lighting Design); Emma Doverte (Production Management); Jasvir Basra (Stage Management); Manuel Edralin (Set Design); Luigi Nacario (Choreography & Costume Design); and Arvin Mercado & Navette Flores (Photography). Regular Run: SEPTEMBER 26 (Friday) and 27 (Saturday), 2014.